A week or two before arriving in Singapore I checked their website and saw that they were offering a 'Banana Nut Crunch McFlurry' as a promotional item, and the day I went in to try the Crinkle Cut Fries, I was planning on getting that McFlurry as well, but decided to leave it until the following day, but sadly when I returned the next day they said it had finished! Whereas in Korea and seemingly the rest of the world, the promotional items change over at the beginning or end of a week (and usually at the end of the month), in Singapore, they finished on a Tuesday (4 July). A couple days later their website began promoting the Horlicks Crunch and because I had only seen the Banana Nut one promoted for about 2 weeks, I made sure to try before it disappeared. 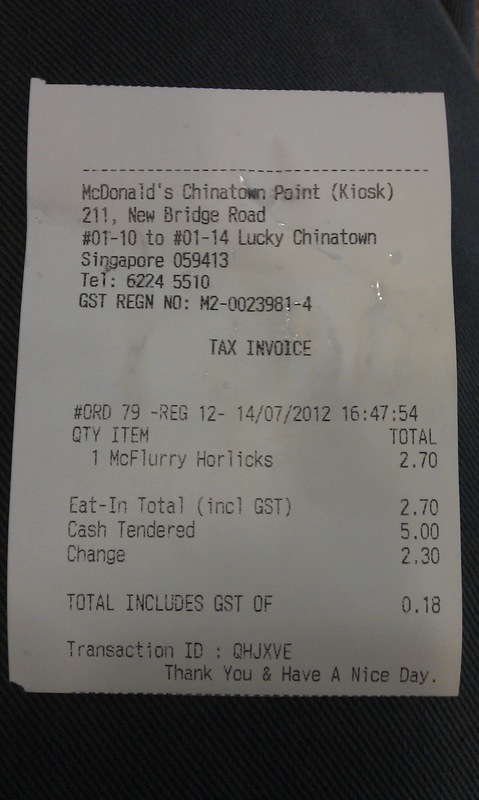 I tried the Horlicks Crunch McFlurry after a 6 hour walk in the Singapore heat. If anyone reading has been to SG before they know of the oppressive heat and humidity that one experiences. 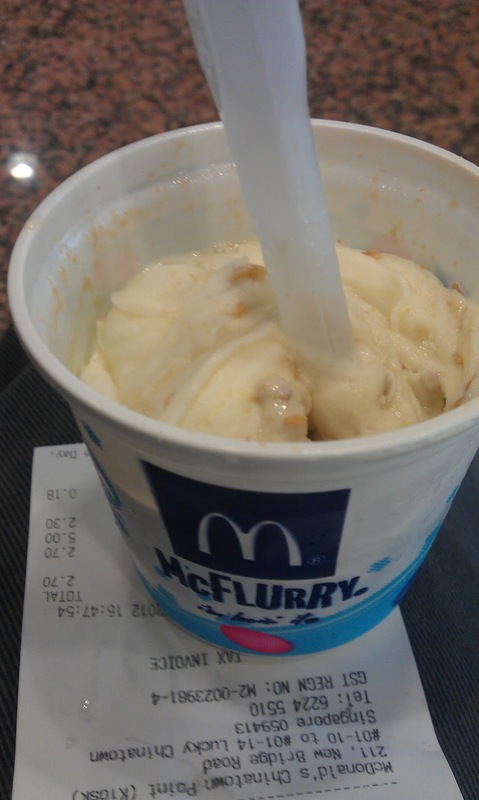 After walking (and sweating) for so long, I wanted some air conditioning and I wanted something cold to eat, it was a perfect time to try the McFlurry. The Chinatown branch was small and didn't have much seating, and the limited seating area was full of mostly tourists with the same idea as me, air conditioning and ice cream. Strangely, this branch didn't have a dedicated ice cream kiosk that many other Singapore McDs have and I was stuck behind an Indian man asking what different kinds of tea they served. The response was Tea and Milk Tea, that man wanted Masala Tea, and though the man taking the order assured him they didn't serve Masala Tea he insisted, and a manager had to get involved. Due to the limited seating, there weren't any available seats for me, so I walked next door to a little shopping centre where I ate my McFlurry. You can tell how in the photo how hot it was by much the ice cream has melted in that 90 second walk and the condensation through the plastic cup was passed along to the receipt. Though my initial thought of Horlicks on a McFlurry didn't sound very appealing, it worked well enough. American readers might understand a little better once they read the Wikipedia description of what Horlicks actually is - " In the initial stage of manufacturing, milled malted barley and wheat flour are mashed together in hot water where the starch is converted into sugars. To this sugar solution dairy powders are added. The water content is then evaporated off to form a syrup which is dried in vacuum band driers to form a cake. This cake is milled into the finished powder. This is then fortified with vitamins and minerals." It wasn't overly sweet as I usually find when its been made into a drink. I've only had Horlicks as a drink in Hong Kong, and I'm pretty sure they make it with condensed milk. 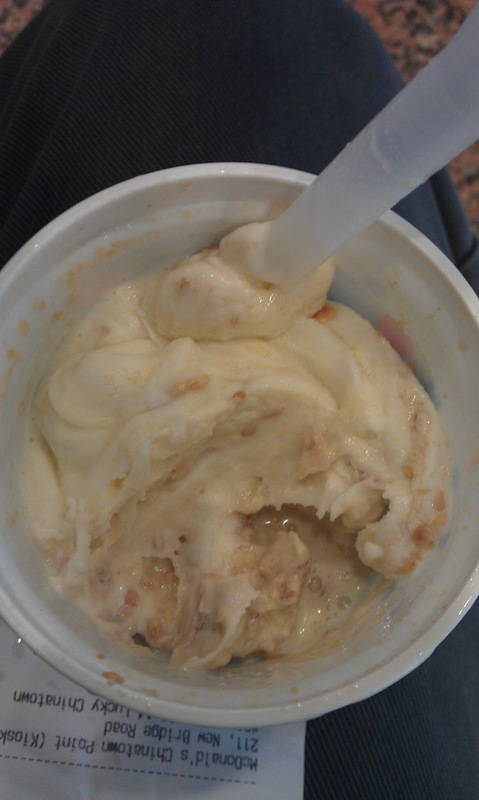 They were pretty generous with the Horlicks powder, so the flavour was mixed well throughout the entire McFlurry. 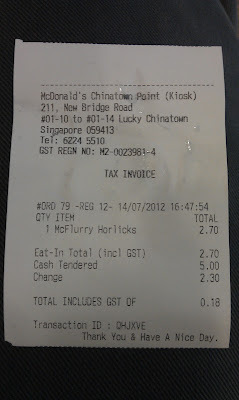 On all their promotional displays they use the "It's Back' slogan, and a quick Google search does show that this McFlurry was in Singapore back late 2011, but it is also a perennial item in Malaysia and seems to be very popular just across the causeway. A surprising combination which worked out rather well. I think this would go over very well in Hong Kong, I'm surprised it hasn't made its way over there yet. Lmao @ masala tea! Maybe mcd could try a masala tea promo lol!